Just got my new eon card today. Woohoo! I can now withdraw my earnings!!! But sad to say, I am bit disappointed with the teller's service. My Union Bank account is located at Ever Gotesco branch. The tellers keep on chit chatting while they keep their customers waiting. On my case, I thought there would still be some papers to sign that's why the teller is not telling me anything but she just keeps on talking to her co-worker and she keeps on doing some papers so I thought those were mine. When I gave her a look that's the only time she told me that my card is already okay and I can already leave. I asked the teller regarding the 4-digit on how many days before I can get it. She said she doesn't know anything about it. How stupid! 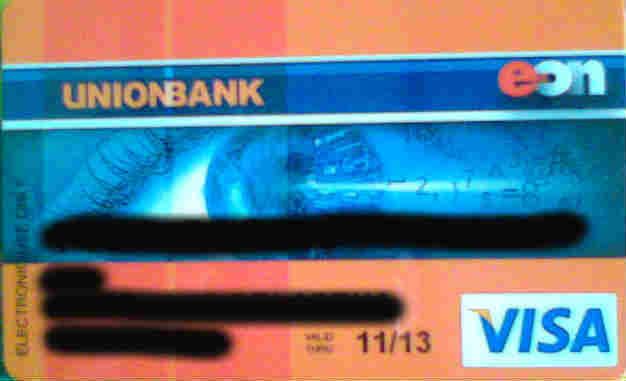 When I first had my EON card, the former teller knows when will I get the 4-digit numbers. She even gave me instructions about so how come that this teller I had encountered with today doesn't know anything about it? So I just decided to call their hot line and maybe address this matter to them. Who Will be the First Celebrity Sole Survivor? Lee Da Hae Insulted the Filipino Teachers?? ?